The P-Series line of variable frequency drives by Cerus now comes with a redundant drive! panel. Cerus’ P-Series line of variable frequency drives (VFDs) now comes with a redundant VFD unit, the Cerus redundant drive panel (RDP). It is designed to provide an economical HVAC motor control solution that maintains full control of an application if the primary drive fails. In the event of a failure, the backup VFD continues to run, using the same control signal as the primary drive. Every precaution has been taken to isolate each drive, thus isolating any problems that could occur andprotecting the functionality of the working VFD. For broad applicability, the drives have been designed to support frequencies from 10 to 120 Hz, making the RDP a great solution for systems running over 60 Hz. 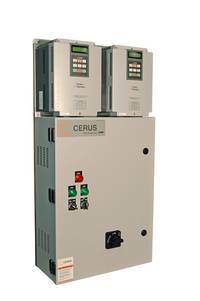 Cerus P-Series VFDs are available in a range of versions from 1 to 125 hp. Learn more at: Franklin or Contact An Account Manager at Setpoint Systems Corporation for implementing drives in your system. This entry was posted in Franklin Control Systems and tagged Business, cerus, franklin control systems, Frequency, HVAC, RDP, Remote Desktop Protocol, Setpoint Systems Corporation, Signaling (telecommunications), Vacuum fluorescent display, Variable-frequency drive, VFD on November 12, 2013 by setpointsystems.